Butternut Farm is a 25 acre family owned Pick Your Own fruit farm which has been in business since the late 1980's. 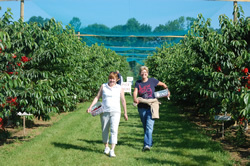 We purchased the farm in 2005 and have been able to keep it true to the previous owner's original vision: Great New England farm atmosphere, excellent fruit quality, and easy picking conditions. Our Farmstand sells locally produced salsas, jams, syrup, honey, and our own sweet apple cider during the fall harvest. While inside the Cider House you will find home made pies, fresh baked farm donuts, and our own Hard Cider (available for tastings and growler fills). Local honey, jam, syrup, McKenzie's Farm tomatoes (in season), and seasonal veggies from surrounding gardeners and hobby farmers can be found in our farmstand! At the farm we make our own pies and Hard Cider! Be sure to call ahead to reserve a pie and check the Hard Cider availability, tastings and growler fills when available.